Caprese salad goes back century's as a staple appetizer for many Italian families, but it was not until the 1950's, when on the isle of Capri, it was served to an Egyptian king. Most of the time, the presentation includes layering large slices of tomatoes, mozzarella and basil leaves around a platter and topping with olive oil. The skewering of the salad is a fun and playful way to make it easier for guests to grab and go. So think of the king that helped make this dish famous and imagine yourself royalty when enjoying this fresh appetizer/salad. Ingredients: *Note: the quantities are not listed below because it is based on how many picks you intend to make. 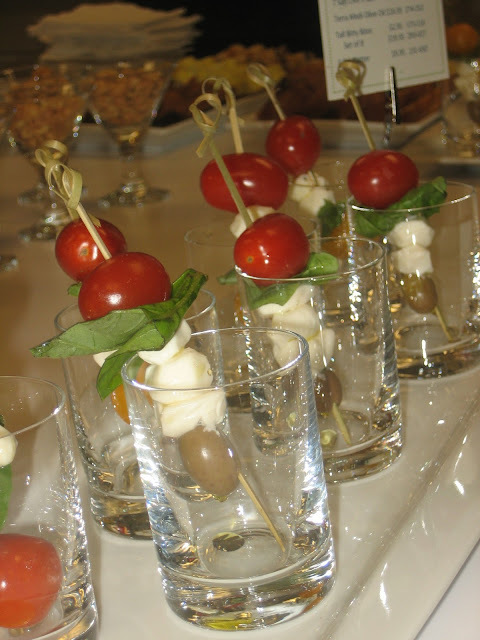 Thread tomatoes, basil, mozzarella cheese, and olives on the picks in the order you would like. Lay flat on a plate and drizzle with olive oil, salt & pepper. Refrigerate until serving and don't poke yourself. Variation: Wrap the mozzarella ball in the basil for a cleaner look.